Looking for a fabulous dress for an upcoming vaca? Need an outfit that’ll set off fireworks for the July 4th weekend? Look no further than Soho Boutique and its big sale July 1. Right in the heart of Hyde Park (not exactly on the square but it’s close on Observatory), this chic shop offers a great opportunity to find the perfect dress. This store is brimming with great finds and tons of light summer dresses. And the owner Amy not only has a great name (hehe!) but she’s very nice and knowledgeable. Stop in July 1 from 10 am to 8 pm for their Early Bird Event and find something great! Items have been marketed down 10-50%! 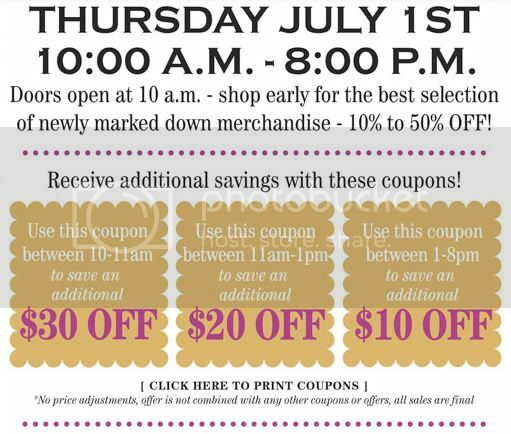 Use the coupon between 10-11 am and get an additional $30 off! Use the coupon between 11 am to 1 pm and get an additional $20 off! Use the coupon between 1-8pm and get an additional $10 off!